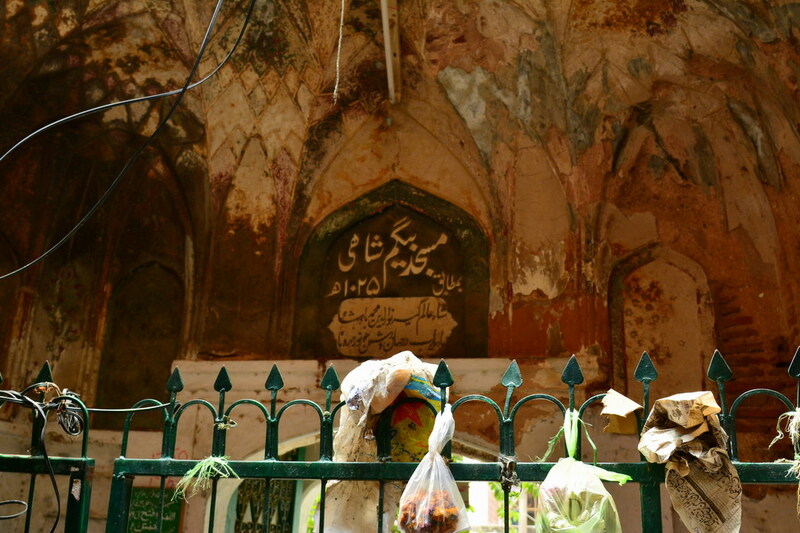 Most of us are unaware of this Mosque which stands right opposite Akbari Gate of Lahore Fort, hidden behind shops. Known as Begum Shahi or Mariyam Zamani Mosque, it is the earliest surviving monument of the Mughal era and is also known as the Mother of all Mosques. The gate of the Walled City directly leading to this mosque is the Masti Gate. The gate no longer exists but a directional sign on the circular road can take one there. 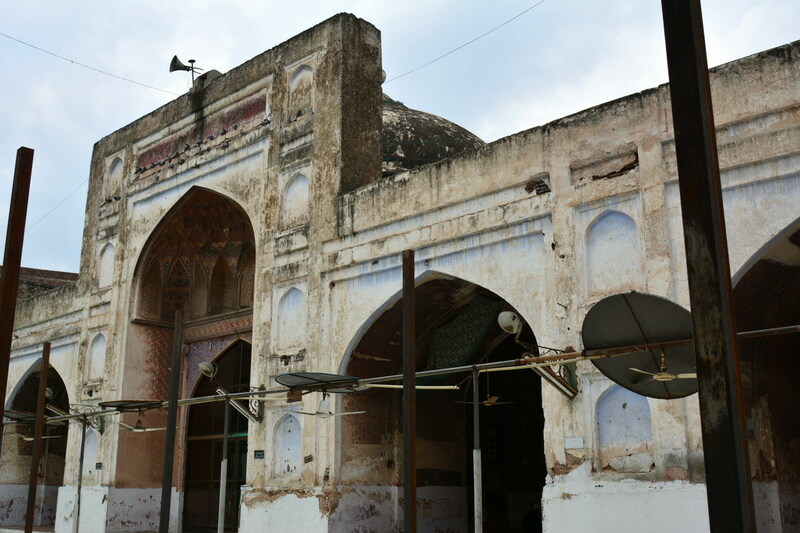 Historians say that Masti Gate was named after this mosque and as Masjidi Gate. Over the passage of time the name was distorted to Masti Gate as known today. According to different architects this Mughal mosque in Lahore is the first to have a five-bay facade that became the main pattern for many mosques built by the Mughals in the subcontinent. The mosque is finished with brick masonry and rendered with plaster. It is a relatively small structure than Wazir Khan and other mosques of its time. Originally, the mosque covered an area of 135ft by 127ft which has now been reduced because of some commercial and residential area built around it; encroachments are also a factor. In the centre of the mosque’s courtyard is a water cistern for ablution, now in much repaired form and has lost the original look. The courtyard was paved with brick tiles but it has now been completely re-laid in modern brick. The prayer chamber, which is 130’-6″ long and 34’ deep, is divided into five compartments. A series of high, deep arched recesses are set in all five compartments inside the prayer hall which enhances the sumptuousness of the mosque. The lower shell is almost purely of ‘guchh’ (stucco). Wooden uprights about 3”x 3″ in section standing between the upper and lower shells with their ends embedded in them are a unique feature. It appears that the builders used them as a means of strengthening and support. 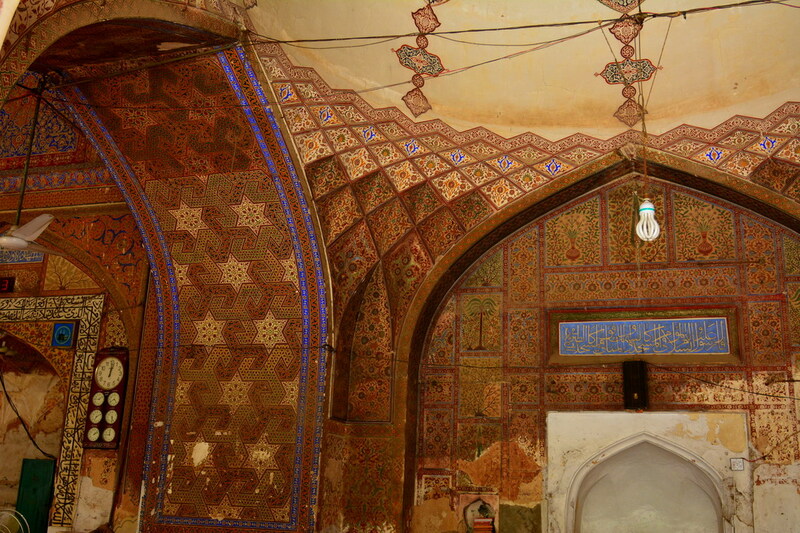 The central mehrab arch is treated with geometric, floral, and inscriptional stucco ornaments. These geometrical designs are unique and rarely found in other buildings and monuments. Some parts of the fresco have been flaked away and some painted with white wash. Mostly the fresco is intact on the ceilings and heighted walls and corners. Regular washing of the premises without proper measures has damaged the fresco work. A proper structural study of the mosque must be carried out by the concerned authorities in order to list down the damages and water ingress which can surely harm the building. The fresco designs include floral and mosaic art work with line patterns. The importance of the mosque also lies in the exceptional paintings which are an example of artistic work known as ‘monnabat kari’. It is defined as the art of decorating the surface of objects with small equilateral triangles painted or made of ivory, wood and brass twisted wire laid side by side that result in a geometrical pattern. The mosque is adorned with several inscriptions, both Quranic and non-Quranic. This characteristic first came alive here among the historic Mughal monuments of Lahore. 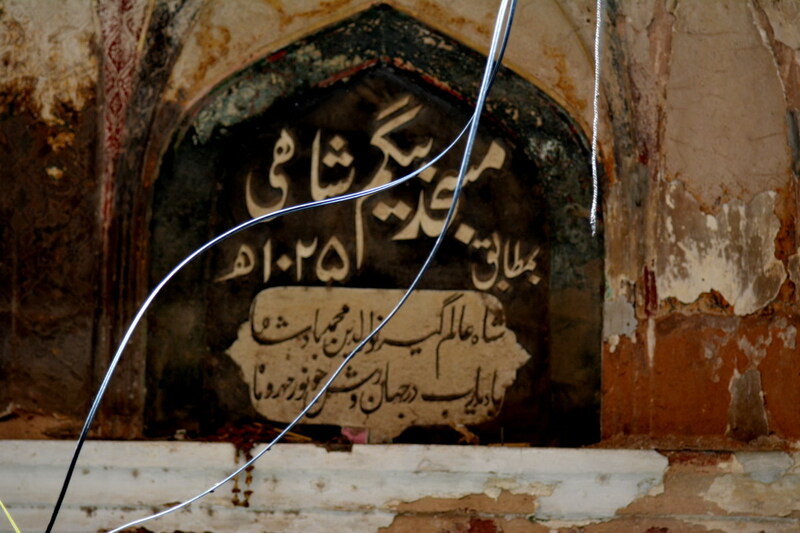 The non-Quranic inscription is the name of the founder and the date of completion of the mosque. 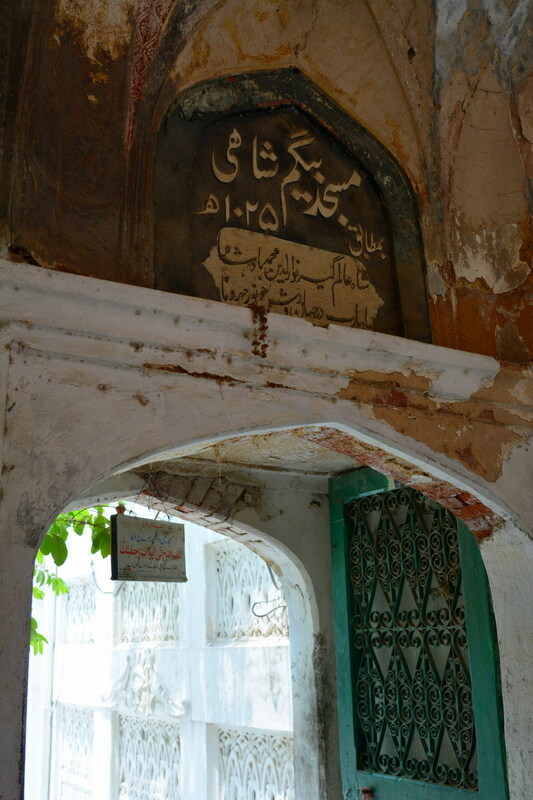 Now coming to the history, the mosque was built in 1611-1614 by the Emperor Nur-ud-din Mohammad Salim Jahangir for his adored mother Mariyam Zamani. 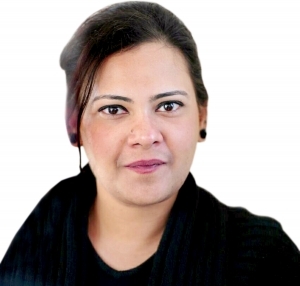 There are a few controversies or maybe mysteries about Mariyam Zamani. Some historians claim that it was Jodha the Hindu wife of Mughal Emperor Akbar (Rajkumari Heer Kunwari of Amber, also known as ‘Maharani Jodha Bai’ in popular culture) as recorded in an inscription consisting of three couplets fixed on the northern gateway, and some say that it was the Portuguese wife. The mystery who actually was Mariyam Zamani is still unanswered, as every school of thought has its own beliefs and logic. Among the Mughals, the queen or the mother of successor to the throne was named as Mariam-uz-Zamani or Mariam-ul-Makani. 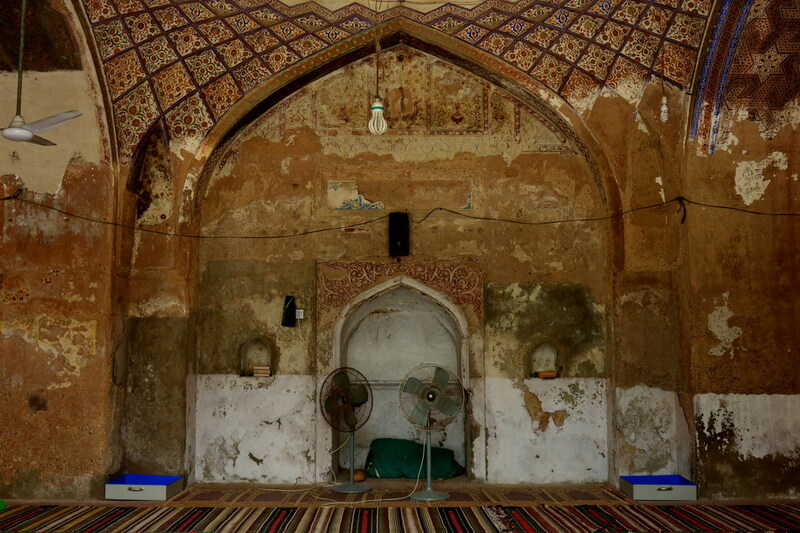 Like many other Mughal monuments and especially the mosques, this mosque endured sundry manipulations in different eras. It was turned into a gunpowder factory by Maharaja Ranjit Singh and became prominent as barood khana wali masjid (the mosque with gun powder). In 1850 the British Raj handed over the mosque to the Muslims who restored it to its original glory. Today may be after partition many modern additions have been made in the mosque, but the gorgeous prayer chamber is still intact. The mosque is functional and prayers are offered in it. 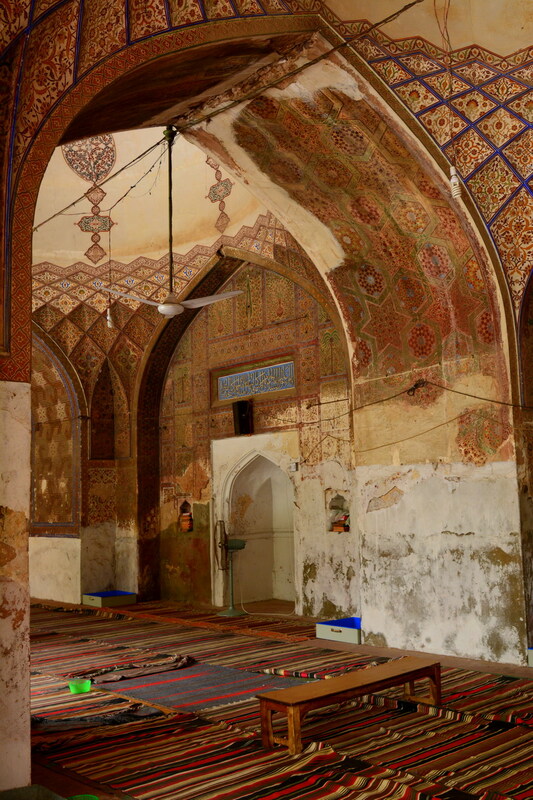 The mosque no doubt witnessed seasons of ups and downs, but at present it is praying for its own restoration. The mosque is unnoticeable because of the countless encroachments upon it. On one side is the largest shoe market of Asia, the Moti Bazaar, while the other part facing Masti Gate is encroached by the Rim Market, the market for alloy rims used in vehicles of all types. 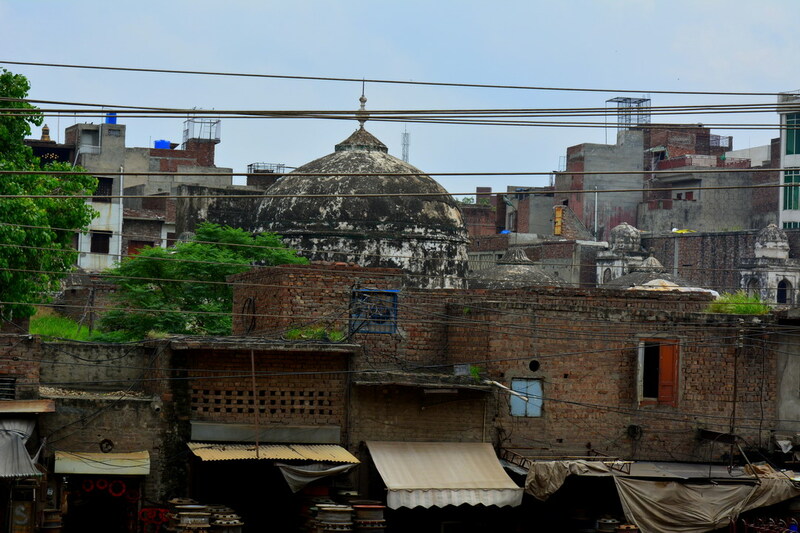 The domes of the mosque can be seen from the roof top of Akbari Gate of Lahore fort, other than that it is not much visible unless we walk into the markets crossing the alloy rims and shoes. The mosque is matchless, at least in Pakistan, for abstinence in tone, assortment of designs and elegance.